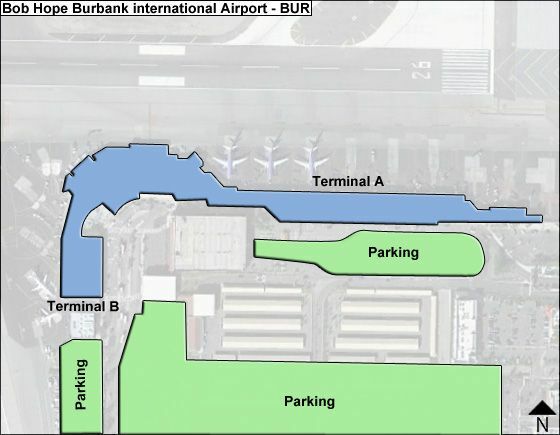 The Main Terminal at Hollywood Burbank Airport is divided into a Center Core, and 'Terminals' TA & TB and either side (referred to as Terminal A Gates (to the right) and Terminal B Gates (to the left). The Main terminal (Center Core) offers customer service, parking pay stations, information kiosk, ATM machines, lost & found, police station, rental car counters, hotel/motel phone center, a news stand and ticket counters. Outside of the Main terminal is the ground transportation and the Valet Center. Aside from shops & services, the gate area now offers nine electric charging stations. Terminal A is served by Alaska, American, JetBlue & Southwest* airlines. It houses a baggage claim area, airline ticket counters 1 through 5, express parking pay stations for Valet & Self-Parking; and past the security checkpoint gates A1 to A9. Terminal B is served by Delta & United airlines, and houses a baggage claim area; rental car counters (in the Transit Center), airline ticket counters 6 & 7, and past security checkpoint gates B1-B5. * Southwest Airlines started service to Dallas-Love June 5; to Denver, Las Vegas, Oakland, Phoenix, Portland (OR) on Aug. 7, and to Sacramento, San Francsco & San Jose (CA). - CUPP check-in kiosks in the terminal are able to serve all airlines serving the Airport. The lineup at A & B sides will provide for each one dual position ticket counter, and two dual head ticket counters next to it. - Nine electrical charging stations are available in the gate areas. - The 'Lunch Box' in Terminal A offers complete restaurant and bar service before passing through the security checkpoint, while various food & drink options are available near the airline gates. - Free WiFi inernet access is available throughout the terminal (ATT & Verizon customers have secure laptopp account access). - Rental car counters are in the Transit Center reached by elevated moving walkway. - The Regional Intermodal Transportation Center (RITC) - reached by elevated covered pedestrian bridge with moving walkways (between Bob Hope Airport Train Station across Empire Avenue to the RITC - includes a 3-level consoldiated rental car facility, rental car customer service building, and a ground level bus transit station.